This is real. This is happening. 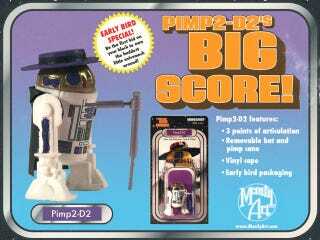 Somehow, some way, Manly Art is producing this amazing Pimp2-D2 figure as an exclusive at this weekend's New York Comic-Con. It's $50 (AND YOU BETTER HAVE HIS MONEY) but I wouldn't worry about it because this droid is going to sell out almost instantly.